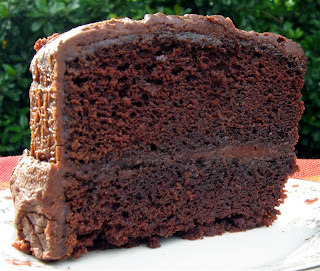 An incredibly moist, dark chocolate cake with a fudge glaze, said to have been created in honor of Mamie Eisenhower by the chef at the Waldorf-Astoria Hotel. My mother made this "Mamie's Cake" for my birthday a few days ago. This cake, along with her Charleston Poundcake (whose recipe I am forbidden to publish) and her Caramel "Earthquake" Cake are legendary among our family and friends. For special occasions my mom bakes the cake in two 9-inch round cake pans and doubles the glaze recipe to fill and frost the layers. For everyday eating or for transporting to potlucks and such, she bakes it in a 9 x 13 pan. Preheat the oven to 350 degrees. Grease and flour one 9 x 13 pan or two 9-inch round cake pans. Combine the milk, butter and chocolate in a saucepan and bring to a boil. Boil until mixture thickens a litte, remove from heat and add sugar. Refrigerate until cool, about 20 minutes. Beat in the eggs with an electric mixer, then add combined flour and baking soda. Mix until blended. Add vanilla and blend in. Bake for 35 to 40 minutes until a toothpick poked in the center comes out clean. For the 9 x 13 cake, cool slightly in the pan on a wire rack. Poke all over the top with a fork and pour the glaze on top while both the cake and the glaze are still warm. For the layer cake, cool in pans on a wire rack for 10 minutes, then remove from pans and cool completely. Make the glaze and let cool and thicken to a spreadable consistency before filling and frosting the layers. If you're really brave you can split each layer in half horizontally before frosting to make an over-the-top 4-layer cake. The easiest way to do this is by wrapping a piece of thread or dental floss around the sides of each layer, half-way up from the bottom. Then, holding each end of the thread, cross them over each other and keep pulling until the thread comes all the way through. Melt the chocolate, butter and water together over low heat. Add in the powdered sugar, salt and vanilla and blend until smooth. Local Hazelnuts (filberts) are ready!